How 'bout them station IDs? Want a web discussion board? On May 25, Kalvos & Damian celebrates four years on the air and three-and-a-half on the net. We've played nearly 4,000 pieces of music and interviewed 100 guest composers. What started as a little replacement show has grown into a new music community. Just about two years ago, on April 19, 1996, we installed our web counter. It's an honest counter, not a 'hit counter' -- in other words, even though Kalvos & Damian's New Music Bazaar contains over 550 web pages and 3,000 separate files, visitors are only counted once, or when their browser cache is emptied. (Our homepage alone would register 14 hits per visitor!). So our thanks to all 84,000-plus of you for visiting us in the past two years, and we hope you'll explore all our features. Kalvos & Damian wants to do more than just entertain ... it provides musical insight from its many guest composers and its two host composers, Dennis Báthory-Kitsz and David Gunn, and works with groups to provide on-line mentoring for students with important composers from around the world. Browse our site, or read our funding report, which details our projects and budget. Have you submitted a link? Then can you help? Our Music Resources for Composers and Music Resources by Composers are suffering from lack of hands. When we began this project in 1995, we could barely find a hundred resources for and by composers. Now there are thousands, and we're simply unable to keep up; sadly, our composer references are over a year old. Volunteers are desperately needed to make these pages useful again. Please click here and see if you can rustle us up some help! In the next week or so, our new homepage, kalvos.org should begin trickling down nameservers worldwide. Still hosted by both Malted/Media and Goddard College, Kalvos & Damian now has an easy-to-remember home as kalvos.org. Please spread the word! Just enter "kalvos.org" into your browser! Oh... and we also have a new postal address due to E-911 changes in Vermont. We are now Kalvos & Damian's New Music Bazaar, 176 Cox Brook Road, Northfield Vermont 05663 USA. For the past year, the K&D weekly cybercast has proven very popular. You can hear Kalvos & Damian's New Music Bazaar live on-line every Saturday from 2:30 to 4:30 pm Eastern Time with this link (which also cybercasts WGDR-FM during its normal 18-hour broadcast day). This link will always be available from K&D's home page or our net audio page -- the best place to bookmark it! Our composer music and interview samples are also streaming nicely. We use the RealAudio method, and you can get a player for your system either from our download page or from Real Networks. We also archive recent programs on Broadcast.com, but we are currently struggling with new RIAA contracts and Federal legislation that make creating conforming programs tricky. We'll let you know what happens in our fall newletter, or you can read the notices posted on our homepage. Listenership continues steady for K&D's archived programs. Broadcast.com continues to offer the most recent shows (see note above), but the main body of archived music and interviews come down the Internet "pipe" courtesy of Goddard College. You can see an index of these archives at our shows page. There are more than 150 shows now, including interviews with John Appleton, Martin Arnold, Michael Arnowitt, Jacques Bailhé, Clarence Barlow, Gary Barwin, Dennis Báthory-Kitsz (twice), Marc Battier, Olexandra Beck, Anita Beckmann, Eve Beglarian, David Behrman, Henning Berg, Susan Bettmann, Peter Beyls, Gilles Yves Bonneau, Craig Bove, Canary Burton, Allison Cameron, Joseph Celli, Joel Chadabe, Rhys Chatham, Nicolas Collins, Dennis Darrah, Maria de Alvear, Jody Diamond, Nick Didkovsky, David Dramm, Arpad Elo, Matthew H. Fields, Howard Jonathan Fredrics, Michael Frengel, David Gibson, Bill Gilliam, Stephen Gryc (twice), David Gunn (twice), Daron Hagen, Tom Hamilton, Jeff Harrington, William Harris, Christos Hatzis, Zeke Hecker, Dietmar Hippler, Fred Ho, Don Jamison, Udo Kasemets, Rip Keller, Chris Koenigsberg, David Kraus, Drew Krause, Johan van Kreij, Anne La Berge, Mary Jane Leach, John Levin, Anton Lukoszevieze, Benedict Mason, Thomas Massella, John McGuire, Elma Miller, Keith Moore, N.N. und Ähnliche Elemente, Erik Nielsen, Mary Oliver, Pauline Oliveros, John Oswald, Stephen Parkinson, Sarah Peebles, Troy Peters, Bea Phillips, Robert H.P. Platz, Larry Polansky, Eliane Radigue, Thomas L. Read, Kaija Saariaho, Michael Sahl, Arthur Sauer, Phillip Silver, Linda Catlin Smith, Ann Southam, Laurie Spiegel, Rick St. Clair, Don Stewart, Carl Stone, Peter Tavalin, James Tenney, George Todd, Richard Tolenaar (twice), Michael Torke, Calliope Tsoupaki, Scott MX Turner, Peter Van Riper, Gwyneth Walker, Daniel Weymouth, and an original student opera. There are special show topics without guests, too: Atonality, funny music, marches, electronic music, a Webern celebration, piano and string quartets, music of the 1980s, Vermont Composers Festival, the odd "wimmintune" in two parts, unique instrumentation, New York composers, "ears over easy", music of war & stress, dance music, unusual combos, recent classics, rhythmic music, music for voices, our Golden Age, music for winds, renting orchestras, homage to John Cage, tribute to Conlon Nancarrow, choruses, a two-week Electroacoustic Music Week special, political music, the Golden Bruce award, and an impeachment festival of marches and dances. There are, however, some changes in U.S. law (the Millennium Copyright Act) which may make these programs scarce. We'll see; the most stringent restrictions don't go into effect for a while. We'll keep you updated, and in the meantime, be sure to be listening. Our most popular sections, Music Resources for Composers and Music Resources by Composers, are desperately in need of a facelift again. The web is expanding beyond our ability to keep up with it as we had, and it's a great disappointment for us to fall behind with this, since K&D was the definitive site for new music links for the first three years of its existence. We have been graced by research from composers David Robert Stewart and Prof. William Harris, who helped us post a refreshed 2,000-link resource collection last June, but we're months and months behind schedule on our latest updates. With current update submissions, more than a third of the resource list will be entirely new for next month. Are you available to research a few pages and update links? Do you have students looking for some research work? Please check our resource pages to see what we need, and then contact kalvos@maltedmedia.com. Kalvos & Damian's New Music Bazaar is a very costly project for we two producers. K&D's fiscal agent is the Vermont Contemporary Music Ensemble, a 501(c)3 organization, and gifts to K&D are tax-deductible to the extent allowed. We are not presently funded by government or corporate grants, and only private contributions let the program continue, along with facilities generously provided by WGDR-FM and Goddard College. You are invited to read our 1998 report to contributors. Please offer your support. For more information, contact us by email, or just write out your check to "Kalvos & Damian's New Music Bazaar" and send it to us at 176 Cox Brook Road, Northfield, Vermont 05663 USA. Gifts of DATs, blank CD-Rs, chrome cassettes, Zip disks, some nice traveling microphones, and other supplies -- as well as help with research and maintenance -- are also welcome. Both our portable DAT recorders have failed after a number of years in service -- they are used for on-site interviews as well as archiving K&D shows and presentations. We have replaced them both, along with other equipment which has given up the ghost after four years on the job, but it's a costly undertaking. Please help! The 5-hour program 2:30-7:30pm EDT (1830 to 0130 GMT) was broadcast in the United States on WGDR-FM in Plainfield, Vermont, and cybercast to the Northeast US from its RealAudio server, with a USA-at-large mirror provided by Jesse Kanner Internet in California. In the Netherlands, the concert received immediate cybercast by VuurWerk Internet via high-bandwidth ISDN, and they provided the main feed to the United States east and west coasts as well. This was the first broadcast/cybercast of an extended live exchange via an Internet connection worldwide, and had only a few minutes of downtime -- one of the most successful experiments in the new technology. Kalvos & Damian's New Music Bazaar is seeking funding to pay its hosts back for the out-of-pocket expenses for technical requirements, publicity, and production expenses. Click here for the photos and a complete audio document of the AmsterDramm evening! This project needs to make up considerable funding -- we came up about $2,500 short. Please contact kalvos@maltedmedia.com, +1-802-485-3972, or write to 176 Cox Brook Road, Northfield, Vermont 05663 USA to make a tax-deductible contribution to this project. 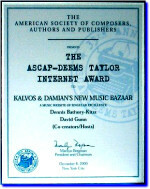 Kalvos & Damian's New Music Bazaar established its Board of Advisors in September 1998. The Board provides assistance and suggestions in matters of funding, publicity, and distribution, offers suggestions on composers to interview and cities to visit for interviews, and helps with problems. Our board consists of composers and active listeners to new music. After a tightly scheduled 1998-1999 winter season, our interview hours are now opening up for summer and fall. We have already had some returning guests -- Steve Gryc, Richard Tolenaar, and David Gunn -- and we'll have some open shows for guests to return. Peggy Madden is not only scheduled to return as a guest, but as guest-host for two special shows. We had hoped to be broadcasting tapes from our Montréal tour by now, but we haven't raised the funding for this. We will be traveling to New York City again this summer, and if you're in New York and haven't been on the show (or have and want to come back), please let us know. If you would like to return as a guest on Kalvos & Damian's New Music Bazaar (or if you haven't appeared at all! ), we'd love to have you on the show. Remember that we're also cybercasting, and the show is heard worldwide. To be a guest, please contact us by email to kalvos@maltedmedia.com, telephone (+1-802-485-3972) or postal mail (176 Cox Brook Road, Northfield, Vermont 05663 USA). Composers on K&D are increasingly popular! Whenever you have new recordings, especially good-quality concert recordings, be sure to forward us a copy. We can't play everything (K&D has been "discovered" by record labels now) but we try to keep our guests in our audience's ears. With cybercasting, the audience has grown dramatically. We also scan the covers of your recordings, and add the images to your web page (see below). Forward your latest recordings to Kalvos & Damian's New Music Bazaar, 176 Cox Brook Road, Northfield, Vermont 05663 USA. New: When you send recordings, we would appreciate a note giving us permission to keep your music as part of our cybercast archives. All of you have been enthusiastic about this in the past, but new legislation is complicating our lives, and this is a pre-emptive request "just in case". Grant us permission to archive, and note that may be withdrawn at your request -- that should cover it. CDs: CDs are the best. When you're making your CD, art is great. That's what we do. We love art. But if obscurity is part of your art, please include a separate contents list, cue sheet, and information page in the jewel box (did we say please?). Playlists depend on it, sales of your CD depend on it, and our good will depends on it. We just hate to say on the air, "This cool CD came in. We don't know who it's from or what it is or what tracks it has, but here's something from it." (Are you listening Ohm/Avatar, RRRecords, Zenflesh...?) An informative spine label also helps. CD-Rs: CD-Rs are also great. Don't use a stick-on paper label from an inkjet printer until it's really dry; these contract when drying and can bend the CD bad enough that it won't play ... embarrassing for you, infuriating for us on a live show. It's best to skip the stick-on label and write clearly on the inner ring (there's still controversy about using "Sharpie" type markers on the CD's upper surface), include a separate title/timings list on the front label and back tray card, and put your name and recording (or major composition) title on the tray card spine so we can read 'em when we're choosing music for a show. We see your name ... we like your music ... airplay! Minidiscs: Same advice as for CD-Rs -- label minidisc and spine with your name and the music, and include timings separately -- yes, we know the timings are on the disc's index, but that doesn't help when we're looking for the perfect 5-minute-22-second piece to end our show. And take advantage of the minidisc's ability to add track information for display. DATs: You knew we'd say it: label the DAT and the j-card. Include your name, titles, index numbers, and a timings list on the j-card as well. Index marks, please! No index marks, no airplay. A 1-kHz tone at or before index 1 is nice, since DAT level is inconsistent from composer to composer. We can play 32, 44.1 and 48kHz DATs just fine. Cassettes: Nyunnnnnnnnnnghhhhh... we really don't like them very much. If cassette is your only medium, please, please, please put only one piece per side, label it with your name and the music's title, include timings, use noise reduction if you can (Dolby B or C, and label which one you're using), and use a fresh, high-quality cassette, not a Wal-Mart special that will drop its felt pad into our player. In any case, cassettes will suffer sonically and we're reluctant to broadcast anything but the coolest music this way. One piece per side! Reels and older media: No. Unless your name is Bartók or Stockhausen, we won't likely dig out the reel-to-reel or Beta or VHS or 8-track (yes, we have one tucked away) equipment to make transfers. If you have a one-of-a-kind rare item (which you shouldn't be sending us anyway! ), email us at kalvos@maltedmedia.com to talk about it. Compressed formats: Not yet -- but soon. We don't have a computer hooked to our broadcast board. When we do, we'll let you know via our homepage notice board. In the meantime, you can be preparing some good-quality MP3 files for us, and you can even FTP them to us at ftp://maltedmedia.com/incoming/, saving postage and atoms! Bytes yes! Atoms no! We actively submit pages to searchers, so fresh information is important. We try to update most of our pages every Saturday night, so please keep us informed. You can send us your text as an email, and you can send us photos and music clips as email attachments -- or through postal mail. You can also use our new FTP directory at ftp://maltedmedia.com/incoming/ We can use brief video clips (under 1 MB) on your pages as well. Some of what we use is listed below. Note: Email us if you use FTP so we can retrieve the files! Text: Please send us plain text via email to kalvos@maltedmedia.com or using ASCII transfer to ftp://maltedmedia.com/incoming/ -- no curly quotes, em dashes, or tabs. We can also scan clearly printed or typed text -- but keep in mind that working with stuff like catalog listings or discographies is time-consuming and they tend to go to the bottom of our pile! Electronic is better! Bytes yes! Atoms no! You can send us audio goodies in RealAudio 3 or 5 or G2 (.ra, .rm) for 28.8 mono or stereo as email attachments, but preferably via binary transfer to ftp://maltedmedia.com/incoming/. You can also send diskettes, Zip disks, or CD-Rs, or point us to a website or ftp site where we can obtain them..
We are now supporting .mp3 files (MPEG-1, Layer 3) on K&D. Let us know your thoughts on this. These files consume space, and space is still at a premium, so send only your best few minutes of material for posting in .mp3 format -- via floppy, Zip disk, CD-R or binary transfer to ftp://maltedmedia.com/incoming/, or from a website or ftp site where we can obtain them..
We recently asked our guest composers to create 10-second K&D station IDs. Fewer than a dozen responded, but those were kewl spots. We love these IDs! Please do a few for us! Record the message in your native language (or another language of your choice! ), and using whatever audio techniques or special effects you'd like. You can mail us a recording to 176 Cox Brook Road, Northfield, Vermont 05663 USA, FTP us an uncompressed or .mp3 file via binary transfer to ftp://maltedmedia.com/incoming/ or email us a .mp3 file (please don't email uncompressed files) to kalvos@maltedmedia.com. If folks could ask our email-free guests to contribute -- or give us their email address if they now have one -- it would be most appreciated. Those whose email we don't have are Eliane Radigue, Clarence Barlow, Shane Rooks, Batya Weinbaum, Barbara Wellspring, Fred Ho, Kaija Saariaho, Ann Southam, Udo Kasemets, Benedict Mason, Dennis Murphy, Glenn Sproul, Craig Bove, Olex Beck, Mary Oliver, and Henning Berg. Email your applet, with instructions (and a demo, if necessary) to add to your web page, to kalvos@maltedmedia.com, or use our FTP site via ASCII (for scripts) or binary (for compiled applets) transfer to ftp://maltedmedia.com/incoming/ site. Source code is welcome for posting if you'd like to share it. Email a text copy (read the guidelines) to kalvos@maltedmedia.com, and include any illustrations, diagrams, etc., in JPEG or GIF format. You can also FTP (ftp://maltedmedia.com/incoming/) the materials using ASCII transfer. If you have no electronic version of the goodies, mail a crisp copy on white paper to us at 176 Cox Brook Road, Northfield, Vermont 05663 USA -- we'll convert them and get them posted. We have set up a web discussion board off-site at Malted/Media at the request of several composers. You can begin using it immediately, introducing your own topics as you go along. If you have a particular interest and would like to have an ongoing section of the board dedicated to it, please contact us to set you up a section and give you moderator status. As soon as (and if) we solve security issues, we can move the board directly onto the K&D site.